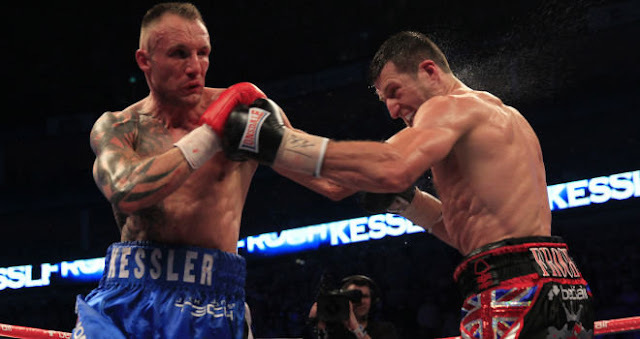 Froch got the better of Kessler in a brutal war. The Cobra demonstrated his full potential here, engaging in a brutal war over 12 rounds with Danish legend Mikkel Kessler last year. Unlike his previous fights, Froch started quickly and bagged the first three, establishing his jab and gaining control over Kessler. A quick start was vital and the Nottingham-man had been working on them in training because he was out-classed by undefeated sensation Andre Ward where the four-time world champion was completely out-classed. Froch would prevent The Dane from gaining any momentum in the first couple of rounds, but the Dane flourished in the middle part of the fight, stringing combinations together which earned him several rounds. Yet again in this fight, Froch proved he has a granite chin and is able to withstand full blooded punches. Kessler caught him flush many times, and The Cobra walked through them. Froch would batter his opponent, however with reply but that also demonstrated his full power and tactical ability to catch Kessler clean and perform his plan to perfection. Remember Froch had everything to prove as his team instated this rematch against Kessler whom already edged him before and didn't have to take the fight. Nottingham-native Froch really did display some of his best boxing skills yet against a world class operator in Kessler which made it all the more meaningful. Froch battered Bute in a one sided demolition job on the Romanian. 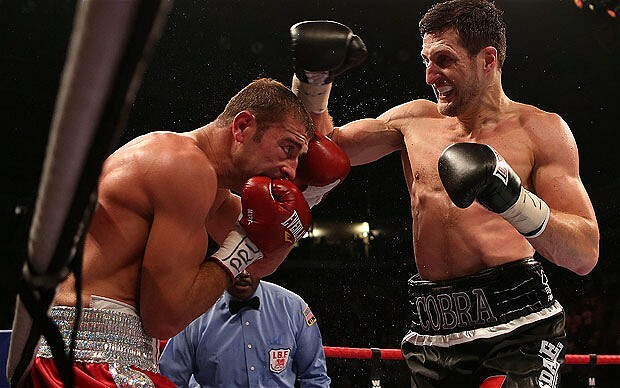 After coming straight off a one-sided points defeat to Andre Ward in 2011, Froch turned his attention to IBF super-middleweight champion Lucian Bute, where the two would stage a contest in The Cobra's hometown of Nottingham. Froch controlled the opening round, pummelling Bute with his long, harmful jab to score and bag the first. Tensions ran high as The Cobra and his opponent locked horns in the second where Froch would establish his jab and land several right hands that shook Bute's boots and gave the Nottingham-based man confidence. The champion failed to gain any momentum in what he was doing, all down to Froch's boxing and power that he worked on in training with Rob McCracken. With his home crowd cheering him on, The Cobra stepped it up a gear and really put Bute on the ropes several times and pounded the Romanian with brutal barrages of punches that split through his guard. Froch was on the verge of something quite extraordinary, don't forget against the world champion who, before this stood undefeated in thirty contest. Finally in the fifth round, Froch ended the one-sided battering when he stalked his man, threw and landed a flush right hand that sprung Bute back onto the ropes where The Cobra would strike, and slice his head off with another big bomb. Bute was absolutely gone, all due to the pure power of Froch and the referee would eventually step in and end the contest. This was one of The Cobra's best ever fights, wiping out an undefeated world champion in five rounds is quite amazing. He took control from round one and pummeled Bute ever since. Long, piercing jabs snapped his head back, followed by occasional right hands that rocked the Romanian almost every time it landed. Froch and McCracken came up with a fantastic game plan. Start quick, something the four-time world champion failed to do in previous fights, which paid off tremendously. The Cobra would become a three time global title winner here. Froch pummeled the champion with thumping jabs that breached through his guard in almost every round. Froch used his physical strength to perfection; pinning The German onto the ropes and pounding him with brutal shots that were probably enough to win him rounds on their own. There was little response from a worn out, battered Abraham who truly felt the wrath of Froch. The Nottingham man scuttled around the ring superbly, making it difficult for the champion to catch him clean or begin a punching onslaught. Abraham found himself in danger of a knockout every single round, as the power of Froch shone through and was used effectively. Right and left hand combinations staggered The German, who failed to answer but also absorbed the punishment. Abraham's high, tight guard was being broken by stiff jabs that snapped the head back almost each time they landed. The champion rattled Froch with a big right hand in the 11th, but the Brit held on comfortably to complete a one-sided demolition job. It takes a huge effort, and boxing intelligence to dominate a world class opponent like Abraham, and Froch and his team constructed the perfect way to do that. The Nottingham-native's quick, pummeling combinations undoubtedly bothered the champion all night long and proved to be decisive on the judges scorecards that read 119-109, 120-108, 120-108 all unanimously in favour of The Cobra who retrieved the WBC super-middleweight strap. 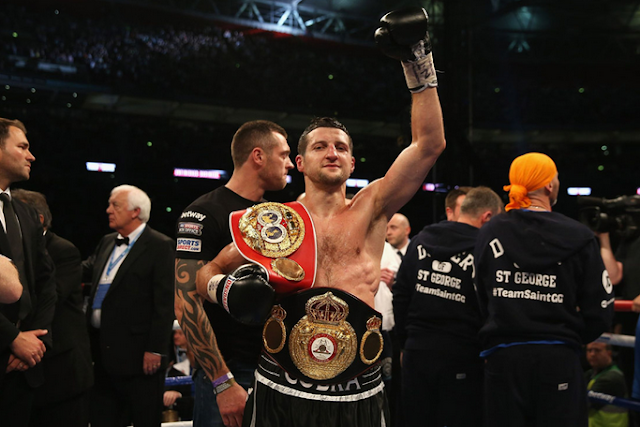 A look at the best fights over the great career of British boxer Carl Froch.